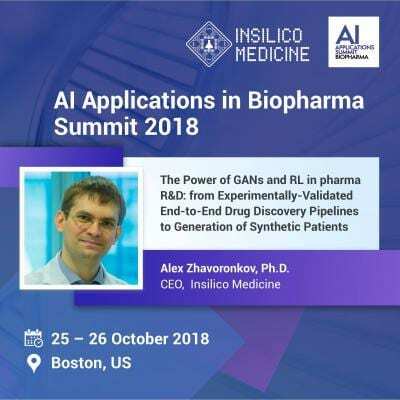 Monday, October 22, 2018, Boston – Insilico Medicine, a Rockville-based company developing the end-to-end drug discovery pipeline utilizing the next generation artificial intelligence, will present its latest results in the applications of the generative adversarial networks (GANs) and reinforcement learning (RL) for generation of novel molecular structures at the AI Applications in Biopharma Summit in Boston, 25-26 of October. Generative Adversarial Networks (GANs) are considered one of the most relevant and interesting inventions in modern AI. Since the emergence in 2014 GANs have become widely known for their application versatility and outstanding results in generating data. The presentation will explore the application of GANs for the generation of molecules with specific properties and generation of molecules to a specific objective. "GANs and GAN-RL systems are powerful tools that helped revolutionize drug discovery and biomarker development applications. At Insilico Medicine we have conducted a series of theoretical and experimental research studies in order to develop the models that could be employed in drug discovery process", says Alex Zhavoronkov, Ph.D., Founder, and CEO of Insilico Medicine, Inc. The AI Applications in Biopharma Summit 2018 brings together the biopharmaceutical community to share the experiences, discuss obstacles, opportunities for partnerships, and the strategies used to implement AI technologies in the discovery and drug development process. The Summit is held on 25-26 of October 2018.